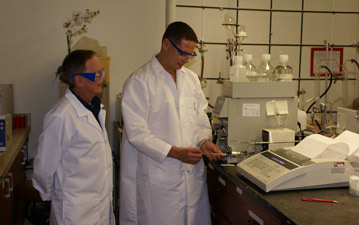 Nathan Gonzalez preparing a sample for HPLC analysis in the Fisher research group. Students electing a chemistry major should have a satisfactory background in high school chemistry and a minimum of three years of college preparatory mathematics. For all degrees and programs in the department of physical sciences , a basic core of courses is required. After these foundational courses, the student is then free to choose from a variety of courses to fit their specific academic plan and career goals. The department offers a B. S. degree in chemistry, a B. S. degree in chemistry with a specialization in biochemistry, and programs for students interested in environmental chemistry, pre-medical, pre-dental, pre-pharmacy, and pre-veterinary specializations.